Improving girls’ education means providing places to take care of basic daily hygiene needs. This article was contributed by Jessica Archibold Maxwell, Program Officer for WaterAid and originally appeared here. It’s an ugly fact that no one likes to talk about: one in three people worldwide does not have a safe, sanitary place to use as a lavatory. We call it the “poo taboo,” and the consequences are as far-reaching as they are preventable: children die from diarrhea caused by contaminated water and poor hygiene; teachers are mocked for defecating in front of their students; women are harassed or attacked when looking for a private place to “go,” and girls miss or drop out of school when they begin menstruating. Growing up on the north Caribbean coast of Nicaragua, I am no stranger to a life without clean water and toilets: I’ve lived it. Over 2 million people in my home country do not have access to adequate sanitation today. I know what you’re thinking: how can water access possibly be an issue for a country steeped in natural resources and nicknamed “the land of lakes and volcanoes?” But an abundance of water – including the largest source of freshwater in all of Central America – does not necessarily equate to an abundance of safe or accessible water. Nicaragua is the second-poorest country in Latin America and the Caribbean after Haiti, ranking a dismal 125 on the Human Development Index. Years of insufficient public investment following war and natural disasters, together with contamination from mining and agricultural activities, deforestation and soil erosion caused by extensive cattle ranching, have left more than half a million people without safe drinking water. Poverty and low levels of human development are significantly worse for indigenous communities like mine who live in remote, hard-to-reach areas – the Autonomous Region – far away from centralized cities, healthcare, education and basic services. While countrywide statistics show that 80 percent of the population enjoys access to piped water and 47 percent is connected to a sewer system, the numbers are dramatically skewed in the Autonomous Regions. There is no sewage system here at all. In stark contrast to the rest of the country, only 18 percent of the population has sustained access to safe water, and 20 percent has access to adequate sanitation. I’ve spent the last seven years working to improve access to water and basic sanitation to the people living here, and I’ve seen first-hand what the statistics expose: nearly half the schools in low- and mid-income countries do not have adequate access to clean water and toilets. And it’s young girls who suffer the most: their health and education, their dignity, self-confidence and future prospects. But if there’s one thing I’ve learned through my work in this sector, it’s that guaranteeing access to clean water, private toilets and good hygiene in schools represents the greatest opportunity we have to bring about change and transformation for girls. In the communities of my region – like so many others around the world – something as simple as access to water or a proper toilet in a school can be the make-or-break factor for a girl trying to complete her basic studies. Take Lisseth. She is a 14-year-old fifth-grader at San Marcos school in the community of Columbus. Before school each morning, she and her younger sisters, Sindi and Mirta help their mother with the household chores. They spend half an hour walking to the nearest water source, where they fill heavy containers and schlep them back home again. Every day, Lisseth and her sisters collect and carry up to 50 gallons (190 litres) of water from the well to their home. Hours of chores already behind her, Lisseth arrives at school only to face similar problems there. Instead of spending recess playing games or talking with friends, she and her fellow female classmates spend their breaks trying to fill their plastic bottles at a well on the property of a man who doesn’t always allow the girls access to it, because he’s afraid they’re going to dry it out. The water smells and is dirty, giving them stomach ache and diarrhea, but they have no other choice. With no running water or toilet facilities at school, girls like Lisseth suffer daily discomfort and humiliation. There are no toilets or latrines at school, and when Lisseth asks permission to go home and take care of her physical needs, her teacher gets angry, reprimanding her in front of the whole class and accusing her of looking for an excuse to get out of class. 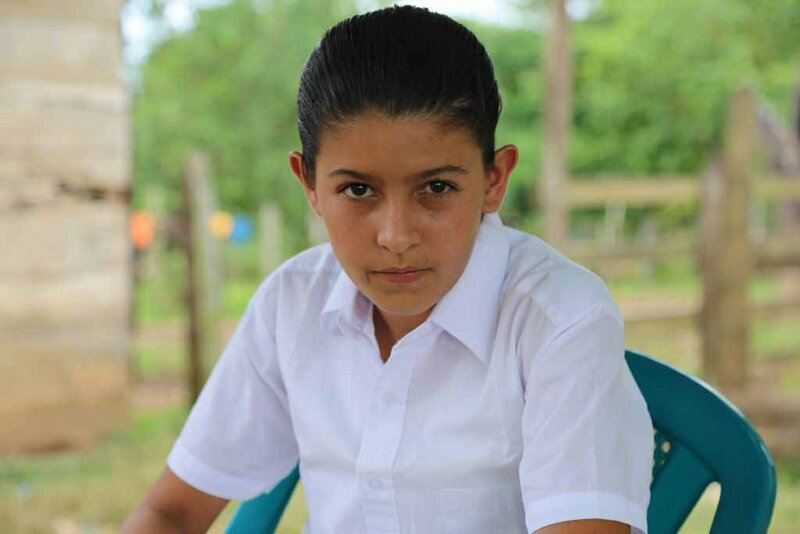 She’s told she “should wait.” Each time this happens, Lisseth feels humiliated and can no longer concentrate on studying, instead counting the minutes to recess when she can run home. It is much worse when she suffers from diarrhea. On those days, she doesn’t go to school at all. The barriers don’t stop there. For young girls like Lisseth, the challenge of taking care of their basic sanitary needs at school is further compounded when they are menstruating. Lisseth’s friend Meyling, 15, lives two hours away from school. She sometimes misses lessons for days at a time when she’s on her period, since there’s nowhere at school to change her sanitary napkins. “I can’t take care of it in any of the classrooms because there are a lot of boys who could see me. That’s why I stay at home every time I have my period,” Meyling said. Most of the girls hide the fact that they are having their period. They pass the days in fear that their school uniform will get stained by blood leaking through the pieces of cloth they use as makeshift pads. They are afraid their pad will fall out if they move around too much. And they are afraid that someone will smell the menstrual blood and laugh at them. It’s no wonder, then, that so many girls like Meyling simply stay at home. When we talk about improving access to education, few people think about water and toilets. Yet these basic human rights are inextricably and fundamentally linked. Until students have clean water to drink and a safe, private place to go to the bathroom at school, girls like Lisseth and Meyling will continue to be shortchanged in their education – if they manage to stay in school at all. During the course of an academic year, girls who do attend schools without water and sanitation facilities can miss up to 40 days of class due to menstruation, forever hindering their ability to achieve their full potential. Lisseth’s and Meyling’s experiences are not unique: millions of girls around the world face the same injustice. Each time I hear another young girl tell me that she had to give up her education because she had to return home every time she had to use the bathroom, especially during her period, I am reminded of my own experiences as a young girl. It’s those memories that strengthen my resolve to ensure that each and every school throughout the Caribbean coast of Nicaragua is equipped with the basic clean water, sanitation and hygiene facilities that will forever transform young lives.